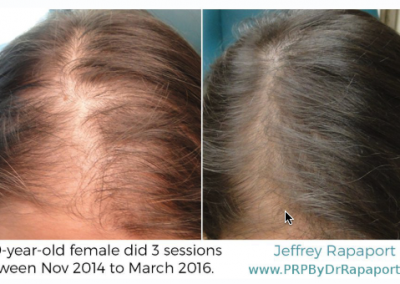 We offer PRP (Platelet Rich Plasma) injections for male and female patterned hair loss. PRP has been used for many years for wound healing and various musculoskeletal problems. It is gaining popularity in treatment for hair loss due to the procedure being little, to no risk with many amazing benefits. Front Range Dermatology Associates is continually researching the latest means to take care of their patients. Make and appointment today to see how this new, innovative procedure is changing peoples lives who suffer from hair loss. PRP is a non-surgical procedure that uses PRP from your own blood. 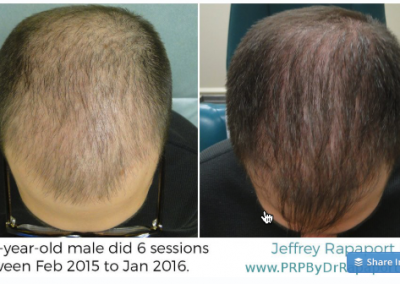 PRP has a variety of natural growth factors that when injected into the scalp in the areas of thinning hair stimulates hair growth and improves the health, thickness and density of your hair by prolonging the growing phase of the hair cycle. 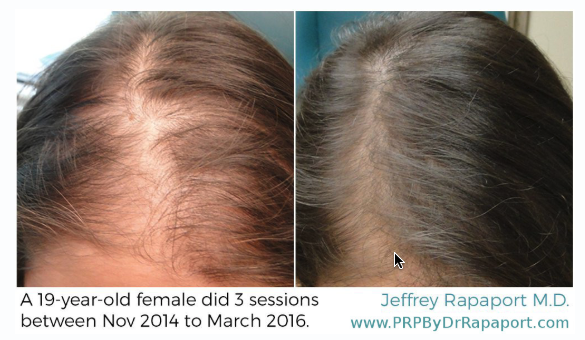 PRP also decreases inflammation in the scalp and improves blood flow. The whole process on average takes about 45 minutes to complete (various factors can increase this time frame on a patient by patient basis). Prior to any treatments, we will take baseline medical photos of the scalp and go over your options for treatment. We will then draw your blood in the office, much like when you go to the lab to have your routine blood draws. There is no need to fast for this procedure. The blood that we draw from you goes into a centrifuge for 10 minutes which separates the red blood cells from the plasma. We then isolate the platelet-rich plasma into syringes inject the PRP into the target area. For best results, we advise an initial 3 treatments separated by 4 weeks and then a maintenance plan (see below). What Can I Expect in Regards to Comfort Level? The injections are relatively well tolerated and managed with ice application. You may experience tenderness/soreness on the scalp as well as mild swelling but this resolves in 3-5 days or less. Although you may be able to personally tell your hair is thicker after your first treatment, it takes 3-6 months after initial treatment to see measurable results. It works best in patients who have experienced their hair loss in the past five years. 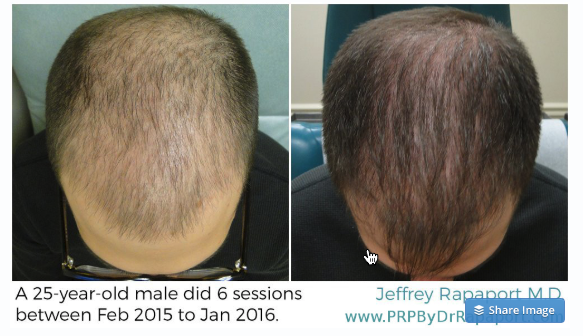 Unfortunately, PRP hair restoration is not a permanent treatment. There is nothing that will change your genetic predisposition to hair loss, so if you don’t do any maintenance to keep the results you achieved with the initial treatments, it will return to baseline. Once the initial 3 treatments are completed, we recommend a maintenance plan of 1 PRP treatment every 4-6 months. Because it is your own blood that is being injected, this virtually eliminates any possibility of an allergic reaction! Like any treatment involving injection with a needle, there is always a risk of bleeding that is easily managed by applying pressure. There is also a small risk of infection and bruising at the injection sites. PRP (platelet-rich plasma) therapy for hair loss is a three-step medical treatment in which a patients’ blood is drawn, processed and then injected into the scalp. Some in the medical community think that PRP injections trigger natural hair growth and maintain it by increasing blood supply to the hair follicle and increasing the thickness of the hair shaft. Sometimes this approach is combined with other hair loss procedures or medications. At Front Range Dermatology Associates we make sure our patients have access to state-of-the-art procedures that benefit you. If you would like to find out treatment options for hair loss or you would like to see what PRP procedures can do for you, give us a call.